Please Choose the items you wish to purchase below by clicking on the PHOTO or clicking on Purchase & Shipping Options! Then you will be asked to choose a shipping option. After doing so you can either Continue Shopping for more products or just choose to Checkout. Freederm Eczema/Dermatitis Skin Rash Cream ( 1 ) Jar - - Sent Priority Mail with Delivery Confirmation. The only eczema treatment that comes with a full 100% money back guarantee and is shipped out the same day. Results in as little as 24 - 48 hours. Thousands of satisfied customers worldwide. SPECIAL: But if you order my \'Two Jar\' pack - you\'ll receive not one, but two jars of cream, plus an extra bar of soap and a moisturizer, for only $59.95. So you get 3 extra products for just a mere $20 more. See details below. You get 2 jars of FreeDerm HC cream, plus a bar of FreeDerm Eczema Soap, and a Jar of FreeDerm Intense Moisturizer. This pack usually retails for $84.80 ... but because you've arrived at this page during our 'discount month' you only pay $59.95. So you save a huge $24.85! But this discount is valid for this month only. So order now or keep reading below for other package discounts. (1) One Bar of Eczema Soap (please notice this is for SOAP not cream, please use links above for cream order). NOTE: Most people find they need more than one bar of our soap. You can buy 2 bars and get 1 free (a saving of $9.95) See 'Bar Special' below. (3) Bars of Eczema Soap - At the price of only $19.95 you get 3 bars of soap. (A savings of $9.95). Can be used by the whole family. 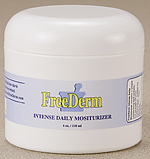 "Brand New" Freederm Intense Moisturizer - Notice this is the MOISTURIZER not the ECZEMA/DERMATITIS CREAM. This is a moisturizer to be used as a maintenance once your eczema/dermatitis is gone from using our FREEDERM HC cream which is listed first on this page. This moisturizer works as a once a day (24 hr) moisturizer. Created for eczema prone dry skin. 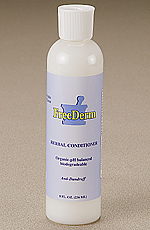 Freederm Conditioner was doctor developed as a second step to moisturizer the scalp and hair without leaving an oily film. Great for kids and adults of all ages. The product will not affect color treated hair. This product can be used daily without side effects. NOTE: You may also want to order the FreeDerm Shampoo. When used together, these two products are 10 times more effective at fighting eczema and dandruff, than if you were to only use one. If you know someone who also suffers from eczema or psoriasis, and you want to help them get better, or if you've been suffering from eczema for a long time, then ordering our 'Whole Sale' pack will be one of the wisest decisions you ever make. SPECIAL: Now this pack would usually cost $299.50 but because you're ordering during our 'discount month' you'll receive a huge 25% discount off the retail price (only $23.40 per jar). The 'Whole Sale' pack contains 10 jars of the Freederm HC cream. But it's only available at this low price for this month only. So order now or miss out! We know that many of our customers use our moisturizer as a maintenance in order to keep there skin soft and smoothe. So we decided to add a BULK option for the moisturizer just like we did for the Freederm HC cream above. SPECIAL: Now this pack would usually cost $149.50 but because you\'re ordering during our \'discount month\' you\'ll receive a huge discount off the retail price (only $12.95 per jar) The \'Whole Sale\' pack contains 10 jars of the MOISTURIZER cream. But it\'s only available at this low price for this month only. So order now or miss out! Please don\'t get confused this is the moisturizer not the same as the FREEDERM HC eczema/dermatitis cream listed above. Many customers have told us that they want to have a bar of our soap by every sink in their house as well as where they work. Not to mention a few bars on hand for the whole family to use during a bath or shower. So we decided to offer a (12) BAR wholesale package at a deep discount during this month only. Keep in mind that soap gets used up quickly especially if the whole family is using it. So why not stock up on something you know your going to need and save money at the same time. SPECIAL PRICING - 40% OFF - ONLY $72.00 for 12 Bars of soap. Grab one or two packages now while supplies and pricing discount lasts.